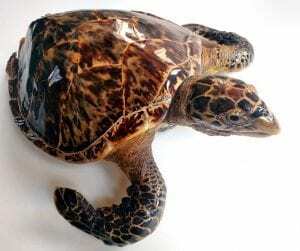 The hawksbill turtle Eretmochelys imbricata lives in warm waters around the world. It feeds mostly on sponges, but will eat a range of sea creatures including fish, crustaceans and highly venomous jellyfish and siphonophores like the Portuguese man o’war. 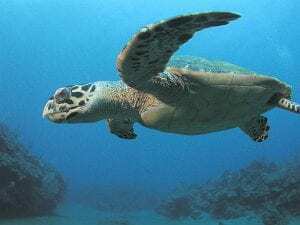 Hawksbills have thick, overlapping scutes on their back and a curved, hawk-like beak, which differentiate them from the other six species of marine turtles. All species of marine turtle are endangered and protected by international law, and you can find out more about the loggerhead and green turtles in our previous blogs. Our specimen is usually on display at the very back of the Grant Museum with two other taxidermy hawksbills. The years have taken their toll on poor old X1580 and it has suffered nasty cracks to its skin, but fortunately our turtle is one of the lucky specimens being conserved in our new project – Fluff It Up: Make Taxidermy Great Again. One of the less fluffy participants, this turtle has been removed from display and will be carefully repaired by conservator Lucie Mascord. Never fear turtle fans, while this specimen is away it has an understudy in the form of Myrtle the toy turtle who will be occupying our turtle’s usual spot until September. No-one will ever know the difference. In the wild hawksbill turtles are threatened by habitat loss, being hunted for food, egg theft and the trade in tortoiseshell. 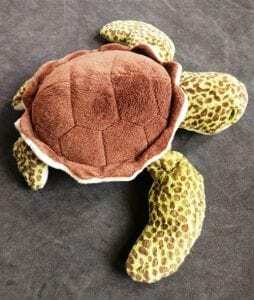 Despite the name, tortoiseshell comes from sea turtles not tortoises, and because of its large, thick scutes almost all tortoiseshell comes from the hawksbill turtle. Millions of these turtles have been killed over the last century so that their shells can be used in decorative items such as combs, jewellery and furniture. Like our specimen, many were turned into souvenirs by polishing the shell and this species is now probably more common as antique objects than as living animals. The International Union for the Conservation of Nature (IUCN) estimates that the hawksbill turtle population has declined by 80% over the last 3 generations, and it is on the Red List as Critically Endangered. It is estimated that only around 20,000 breeding females are left in the world, and this is especially worrying as it takes 20-40 years for a hawksbill turtle to mature, so any recovery in the population will be slow. This species has been protected by the Convention on the International Trade in Endangered Species (CITES) for 40 years, but the population is still declining. We conserve and protect our specimens so they can be used to learn about species without harming living animals. We cannot and would not take this specimen from the wild today, but this particular turtle can now provide a cautionary tale of what happens if we exploit wild animal populations.